On Wednesday, 7th March 1990 at 6.50PM, BBC2 will be showing a documentary featuring one of the most successful bands of the 80s - SIMPLE MINDS. This 40 minute film documents one year - 1989 - in the bands' career. A one in which they had a British Number One hit single with Belfast Child, a Number One album with Street Fighting Years, and a very successful World Tour. 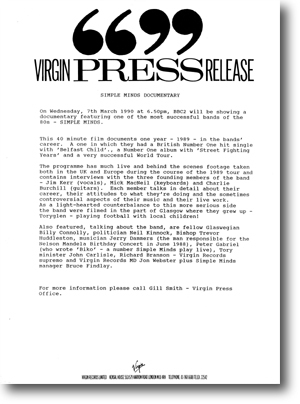 The program has much live and behind the scenes footage taken both in the UK and Europe during the course of the 1989 tour and contains interviews with three founding members of the band - Jim Kerr (vocals), Mick MacNeil (keyboards) and Charlie Burchill (guitars). Each member talks in detail about their career, their attitudes to what they're doing and the sometimes controversial aspects of their music and their live work. As a light-hearted counterbalance to this more serious side the band were filmed in the part of Glasgow where they grew up - Toryglen - playing football with local children. Also featured, talking about the band, are fellow Glaswegian Billy Connolly, politician Neil Kinnock, Bishop Trevor Huddleston, musician Jerry Dammers (the man responsible for the Nelson Mandela Birthday Concert in June 1988), Peter Gabriel (who wrote Biko - a number Simple Minds play live), Tory minister John Carlisle, Richard Branson - Virgin Records supremo and Virgin Records MD John Webster plus Simple Minds manager Bruce Findlay.